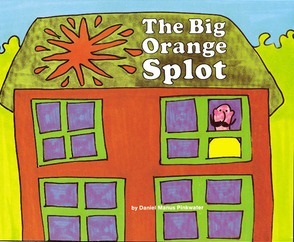 The Big Orange Splot by Daniel Manus Pinkwater is a slightly silly tale with a significant message. What would you do if a big orange splot of paint landed on your home’s roof one day? Would you paint over it? Would your neighbors “encourage” you to do so? Mr. Plumbeam lived on a perfectly pleasant street. All of the houses were the same. They were all pleasantly, comfortably identical, that is, until something strange and unexpected happened. For some inexplicable reason, a seagull flying by with a can of paint spilled a big orange splot right on top of Mr. Plumbeam’s house. The neighbors naturally expected Mr. Plumbeam to paint his house back the way it was, back to being the same as everyone else’s house. Quiet, unassuming Mr. Plumbeam, on the other hand, decided to do something entirely different. Mr. Plumbeam transformed an unfortunate incident into an opportunity for self-expression. His home eventually became an explosion of color. Every time any of the neighbors tried to talk Mr. Plumbeam out of his nonconformity, they walked away from the discussion feeling compelled to express their own individuality instead. One by one the neighbors awakened to the value of embracing change and celebrating diversity. An entire block of once identical homes soon became a reflection of all their inhabitant’s dreams, creativity and imagination. How did this happen? Because of one big orange splot and one neighbor who chose to hold fast to his own dreams, express his creativity, not be swayed by other’s judgements, and encourage others to reveal their true selves. While the silly words and silly pictures in The Big Orange Splot certainly appeal to little ones, the philosophical messages are just right for any age. Use this picture book as a fun discussion starter about standing up for what you believe in, celebrating differences, believing in yourself and your dreams, and so much more. Love learning about inspiring children’s books like this one? Find more by visiting some of my favorites.